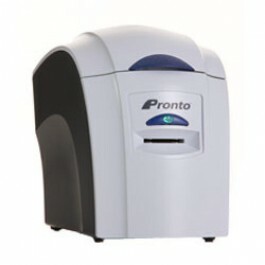 The Magicard Pronto printer delivers low cost printing and free card visual security with its built-in HoloKote anticounterfeiting watermark feature. A choice of 4 FREE standard watermark designs are selectable via the driver. The Magicard Pronto printer features single card feed that allows you to produce a personalized card on demand in moments. It offers edge-to-edge and sharp image quality for simple and easy card printing in a compact and highly reliable package. Its intuitive design with a colour-coded status LED, USB interface and Microsoft certified plug and play driver, make the Pronto easy to use, set up and operate straight out of the box.